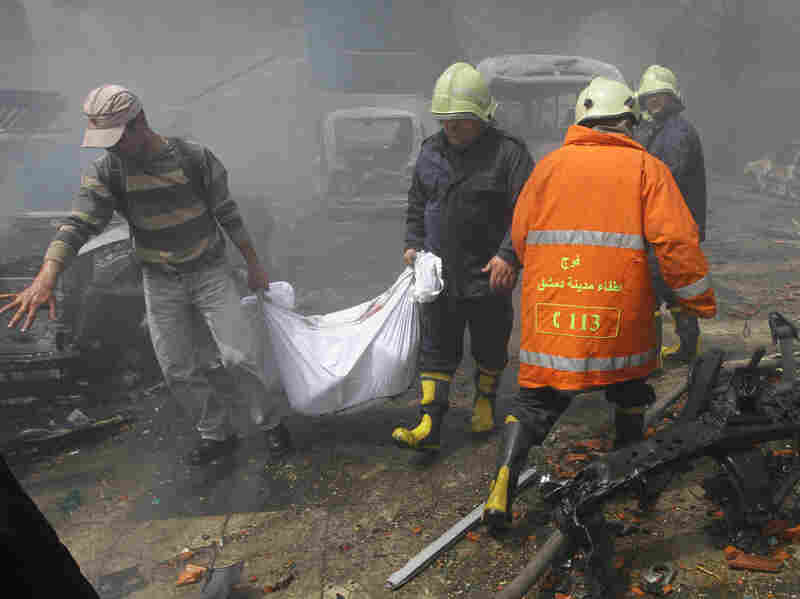 Deadly Blast In Damascus Reflects Growing Danger In Capital : The Two-Way A major blast inside what's known as the "Square of Security" in the Syrian capital today is the latest sign of the deteriorating security situation in the capital. The instability has grown so quickly in the past month or so that many die-hard Damascenes are fleeing. A deadly car bomb explosion rocked central Damascus, Syria, in front of the Finance Ministry building (center) and the Central Bank (right) on Monday. Editor's note: The author is a Syrian citizen living in Damascus and is not being further identified for safety concerns. 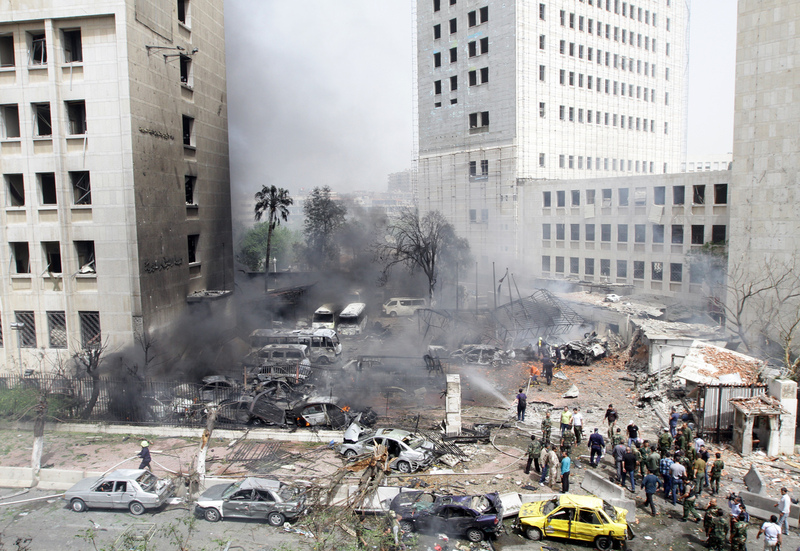 The major blast that rocked Damascus at midday Monday took place in what has come to be called the "Square of Security," an area of about a dozen urban neighborhoods or so that are under tight government security. It's also home to major government buildings, including the Parliament, various ministries, major intelligence branches and foreign embassies, now mostly closed. Fighting has flared on the edges and outskirts of the city, but inside the Square of Security there had been no direct clashes between rebels and government forces. There have been occasional car bombs, but no sniper fire, no impromptu gunfire exchanges, and no bombardment by fighter jets. Life here has felt largely isolated from the daily violence of the past two years, as the Syrian uprising descended into civil war. But over the past month or so, this feeling of relative calm has changed drastically as the Square of Security has come under repeated attacks. There have been at least half a dozen bombings, car bombs or otherwise. There have been mortar and rocket attacks that landed smack in the middle of busy streets at rush hour and public parks where children play. Shells fell in busy traffic circles and in the courtyards of homes. Dozens have been killed and many more injured as a result. The rebels have taken responsibility for some attacks, but not all, blaming the regime for orchestrating the more deadly ones. The government, on the other hand, always blames the rebels, calling them terrorists. The situation inside the Square of Security has deteriorated so fast that many die-hard Damascenes have left town after vowing for months that they would never leave, no matter the consequences. Now, most Damascenes can name a dozen or so families they personally know who have fled abroad in the past couple of weeks alone. Monday's blast was yet another reminder of how quickly the situation inside the Square of Security has gone downhill. At the site of the blast, determining who was responsible depended on one's sympathies. Syrians who root for the rebels blame the regime for almost all acts of violence. Those who still support the regime blame everything on "terrorists." Besides, no one would ask such a question, certainly not in public, where armed government security agents roam in civilian clothing, and everything has eyes and ears. But none of this takes away from the calamity of the attack that killed at least 15 people, according to authorities. Barely minutes after the blast — which was heard in almost every corner of the Square of Security — emergency vehicles, sirens wailing, rushed to the gruesome scene. Incinerated bodies and body parts lay alongside dozens of injured people. A couple of hours later, after the initial emergency response, pale-faced and stunned people descended upon the site to witness the extent of the damage. At the scene, women congregated and shared snippets of what had happened — where each one stood when she first heard the blast, what she was doing and where she had been headed. Their chatter contrasted with the silence of merchants with tall broomsticks as they swept the broken glass in front of their damaged shops. At one pharmacy across the street from the blast, almost everything inside was gutted. There was no glass, and the metal was melted crooked. A few shelves of medicine remained standing on one wall. The shadows of two men could be seen inside the charred space. They were sifting through wreckage, quietly, as a baffled crowd stood and watched, also in silence. Perhaps feeling some indignity or suddenly growing self-conscious at the cruelty of his fate, one of the men inside the pharmacy looked up at the crowd and, with a barely audible voice, asked them to disperse. "If you have no business here, God be with you," he said halfheartedly, before returning to his sifting. Across the street, at the actual site of the blast, a bulldozer was sifting through the rubble, which took up a good portion of the street. "What have they done to us?" asked one woman, to no one in particular. "May God paralyze them, may God paralyze them," another woman prayed loudly, her voice cracking into a shriek, her arms flailing. She was staring at the wreckage left by the blast.